These Saints were from Aegae in Cilicia, brought up in piety by their parents. Zenobius was a physician, and healed many freely by the power of God; because of his virtue he was consecrated Bishop of Aegae. With his sister he was taken by Lysias the Governor, and after many tortures they were beheaded, about the year 290, during the reign of Diocletian. With songs inspired by God, let us now render honour, as is due unto Zenobius and wise Zenobia, the pair of siblings in the flesh, who proclaimed true religion; those two martyrs of truth, who, passing their lives as one, also received together through martyrdom crowns that shall not fade. 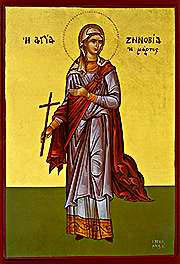 Share the feast of The Holy Martyrs Zenobius and His Sister Zenobia with an icon greeting ecard.